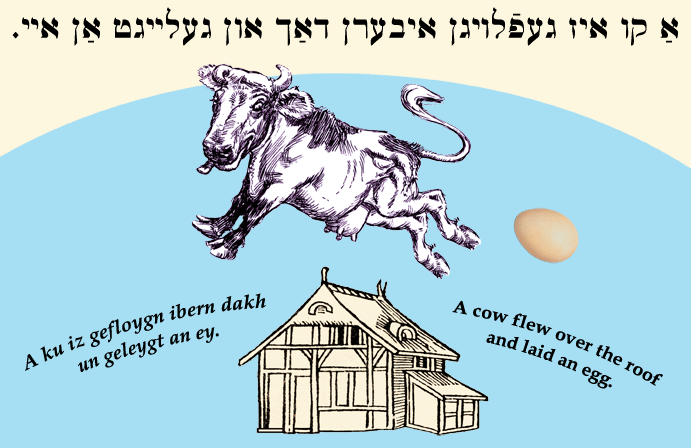 Yiddish Wit: A cow flew over the roof and laid an egg. אַ קו איז געפֿלויגן איבערן דאַך און געלייגט אַן איי. A ku iz gefloygn ibern dakh un geleygt an ey. A cow flew over the roof and laid an egg. A ku iz gefloygn ibern dakh un dem ek farloyrn. A cow flew over the roof and lost its tail.